Published: Sep 5, 2015 to ? Long ago, there was a god of light and a god of darkness. While those devoted to the god of light experienced happiness and good fortune, the god of darkness would play tricks on the people and steal their joy. And so, as the legend goes, the god of light decided to punish him by turning him into a monster. Enraged by this, the god of darkness wielded his punishment as a curse in order to inflict suffering upon others. Because of his actions, he was banished to the Outside, where he and his monstrous children are to remain for eternity, while those from the Inside must never come in contact with someone from the Outside, lest they be cursed with a hideous form. A little girl named Shiva, an Insider, is found by an Outsider she comes to know as Sensei. Though they cannot touch, Sensei cares for Shiva as best he can, and together they live a moderately happy life. But soon, Shiva not only finds herself in danger from the Outside, but from her own kind as well. Totsukuni no Shoujo has been published in English as The Girl From the Other Side: Siúil, a Rún by Seven Seas Entertainment since January 24, 2017; in French by Komikku since March 9, 2017; in Polish by Studio JG since April 28, 2017, and in Spanish by ECC Cómics since October 3, 2017. This is such a find! A sad and beautiful story about a little human girl and a monster, who takes care of her, living together in a forest, because… Don’t want to spoil anything, don’t know enough yet, but I urge you to check this out, at least for the art, if nothing else - it's lovely and it's unique. Also there’re plenty of things to talk about besides retelling the plot. The second name of this manga is Siúil A Rún (Go, my love), the name of an Irish song, also sad and beautiful, about a lover, who left for war, and about the wish for safety. I’ve already mentioned “sad” twice, editorial remarks on the first pages of this manga say the same, and it’s not an overstatement – there is this calm, all-engulfing feeling of fragility and impermanence in the everyday (initially everyday) actions of the heroes, that we witness. It may be ok, but it’s a small light in the night, will it last? You know it won’t, the time runs out as you mark it. As seasons change, things will end, the flowers of today will wither. It’s not that I can say much besides metaphors about the plot anyway. There’re only 4 chapters, and a lot of time has passed since the last. So why write a review? I know that the more advanced members of Mal scoff upon such things, but I do want more people to know about this manga, the available chapters are substantial (>30 pages each), and I was so impressed, that even if this manga flops or disappears immediately, I’ll have good memories left (so I kind of just wish to share a good thing). Also it’s worth to mention that this work seems to follow the delayed exposition pattern: we start with a closed-off point of view, focused on the immediate small events of the life of the main heroes, and there is effort to make the little girl’s days normal, so it will take time to learn the secrets of their world. It looks though that there will be violence, there’re topics of death and fear of otherness already present, and there is a scary curse. Delayed exposition stories have failed me before, this I confess, and I have a small fear that this may go the “evil humans, misunderstood monsters” route or ends prematurely (I’ll update the review then), but so far the premise seems to be well thought-out and powerful, there’re hints on an important flashback, and a new character is lurking around. 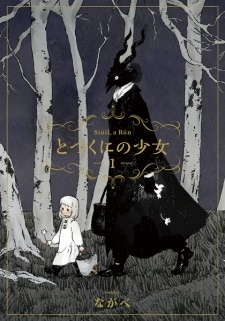 The biggest problem for this manga is that it outwardly overlaps with popular Mahou Tsukai no Yome: this is another Mag Garden publication, that is female-oriented shounen and has a tall horned male monster taking care of a human girl. But internally Totsukuni no Shoujo is very different, I say it as a person, who doesn’t like Mahou Tsukai no Yome for the strange relationships it offers, and absolutely loves this. For starters, there’s no romance or even a possibility for it between the main characters in Totsukuni no Shoujo - the age difference is too big, so it has a parent-child dynamic (or, more specifically caretaker-child, a bit colder), secondly, it's much more scary, and, lastly, the plot looks like something more focused. So, in short, only characters look the same, and maybe the curse aspect, that can be seen as magic. Talking about characters: we have a sweet good little girl, an ideal child, no surprises here, and a big wendigo-like monster, who is surprisingly inhuman, not only in appearance – for example, he doesn’t eat. The biggest mystery lies within him, but it seems that he also has experience, but not knowledge, so it will be a journey of discovery for both. I think that both mains are likeable, and there is not too much doting, which is good. The art is amazing. Since there’s no other manga by this author translated, I checked the author’s profiles on mangaupdates and pixiv. It looks like she likes to draw anthropomorphic animals (mainly male figures with animal heads) and monsters. This is what makes me worry about the plot, and I also am not yet sure if people well be drawn well, on the other hand it gives hope for good monster designs. Most of her work on pixiv is very good smooth digital art. And the art in this manga is stylized, but it also has this painting or illustration feeling, that sets it apart. It’s soft, but it isn’t made of long flowing strokes, but instead is sculpted with small strokes, reminiscent of line art. There were a couple of hard to read panels, but mostly it’s readable and pretty. The forest is especially well done. All in all, I have high expectations for this manga. High worries too – it needs to become more tense and epic later, and female-oriented works tend to underachieve in this regard. I am also unfamiliar with other mangaka’s works, so it is hard to say how she handles stories. On the other hand, even the few available chapters are a treat, so I will be content I've found it in any case. And if the rest is good, this will be a contender for 9/10. "The Girl from the Other Side" is, without exaggeration, one of the finest manga I have ever read. Here's why you should read it. It's unusual to start with the art but here it's well deserved. This manga looks unlike any other I've read - its style is quite reminiscent of 19th century childrens books and western fairy tail artwork and it pulls off the style superbly. The colour scheme and small details perfectly compliment the simple but subtle story. The story of TGFTOS will be quite familiar in tone to anyone who has read a western fairy tale - innocent and sweet on the surface, but with far more sinister undercurrents underneath. While the story itself is certainly enjoyable and suspenseful enough, what really kept me going through this manga was the interactions between the girl and the outsider. More is told through the artwork and silent panels than by dialogue. A new manga published in Mac-Garden very similar to Mahoutsukai no yome( Ancient Mangus Bride) if u like Mahoutsukai no yome you gonna like this. Slow pace and kinda magical. If you think long and hard, your will find out I've seen this type of story before but not in a manga. Feels like a classic fairytale in a manga form and feels really original. There is a lot of suspense with the whole "curse" its going and that because the story doesn't give you what you want but only what you need to know. This is the best part about the manga. This is not your classic manga art with big eye cute girls. Its simple, a few touches of screen tone and it feels old n rusty and European. And thats great. The art compliments perfectly the story and all the feel of this manga, makes it a more unique of an experience and makes you want to read more. No other art style is more feating than this right here. Nothing really ground breaking about them, the cursed characters are pretty mysterious. The human character and really human like character. They fear the outside world, trying to defend their selfs from the curse. The little girl is a normal little girl. That actually fine. I thing the point of this manga is not to get attached with the characters but to experience the whole thing. I enjoyed a lot. Its an easy read and take you in to a big journey in a small scale world. If you like fantasy and unique art this is the perfect manga for you. This is such a wonderful story that it brings the capacity of artwork enjoyement to a whole other level, this gives a feeling of necessity and how having someone to really care about is something that can completely change your life, the atmosphere that reding this story gives is one of the most beautiful experiences one can find in this medium. The story focuses on a black person that is called teacher through the series and his shining relationship with shiva a little girl that behaves like a girl of her age would do and makes him feel comfortable with himself and his life with her as the center of it. Teacher truly cares about Shiva like a family and only wants what's better for her, she does things that i really love because of the feeling of familiarity that it gives, take as an example when she says "let's have a tea party" that's something that feels and gives an atmosphere of familriaty and house life in family, i'd really love to have a child as lovely and kind hearted as her. Also Shiva has a grandma that's really the only "human" with which she can count because she has always been with her and has treated her as her family too. The art is just on another level, the artwork of this is truly game-changing and makes everything better, the use of colors and especially how they're used gives the fairy tail like atmosphere of the series a new meaning making it more impactful and stimulating, the way the characters are designed and depicted gives the artwork behind them the recognition they deserve and let us see the amount of work that has been put into it to just make this possible. It isn't commom to read a series so gorgeous and beautiful as to let you speechless but this time it has been done with mastery and a sense of meaningful purpose that gives everything that can be experienced feel more real and natural than they would have been without it. The characters feel like normal people in an unconventional way, the characters are different to normal people but behave with intelligence and a sense of surviving similar to how humans do it. The relationship of Shiva and Teacher is the most important point of the whole series and it's done with such mastery and sense of neccesity and knowledge on how it needs to be done in order to be as coherent and cohesive as it could possibly ever be. I enjoyed having the experience of being able to read this series because it was such an amazing, impactful and beautiful read that gives some meaningful tips on how a real relationship between people that care for each one as family should be and it makes it a worthy series. When are new chapters out?